Entering the 2013-2014 season, defense stood out as the biggest weakness of the Dallas Stars. The depth chart was comprised of two average defensemen, an aging veteran, an injury-prone depth defender, two sophomores and a few rookies. That’s far from ideal for any team let alone a team trying to crack the tough Western Conference playoff bubble. It was ugly at first. Defensive miscues, turnovers and failed clearing attempts plagued the Stars early on. With more practices and games under their belts as the season moved along, the players grew more accustomed to the new schemes and strategies set up by new coach Lindy Ruff and his staff. Chemistry grew, the team gelled and defense became a strength en route to the Stars’ first playoff berth since 2008. Compared to last season, the Stars statistically improved on defense even though the unit looked fairly similar. Goals against per game dropped from 2.94 to 2.72, moving the Stars to the middle of pack in the league that regard. Five-on-five ratios grew in favor of goals for, and the penalty kill rose from 81 percent to 81.4. Shots allowed per game dropped from 31 to 30.4, and the team’s winning percentage rose when being outshot. Below are my grades for Stars defensemen for the 2013-2014 season. Though the statistics may not prove it, 2013-2014 was a career season for Daley. His surge in the second half of the regular season and the playoffs took the team by storm. He was forced into a top-pairing role after Robidas’ leg injury at the end of November. Daley himself suffered a sprained ankle that saw him miss some time, but he returned with a vengeance. Daley was paired with Goligoski, and they were tasked with facing opponents’ top forwards while logging over 22 minutes for most of their games together. Daley only logged 20 minutes in four of his first 15 games of the season. In the final 15 games, he hit that mark 21 times and even reached 23 minutes 10 times. He played over 22 minutes in each of his six playoff appearances.Daley’s nine goals were a career-high and led all Stars defensemen. His 25 points were tied for the second-highest of his career while playing at least eight games fewer than his more productive seasons. His plus-10 was a career-high and second-best among Stars defensemen. 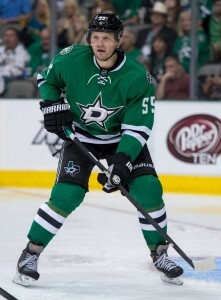 He finished the season tied for first among Stars defenseman with a Corsi rating of 50.9. This season was a tale of two halves for Goligoski. Stars fans’ favorite lightning rod stumbled out of the gates with a tough October. He registered one point in 11 games and was a minus-9. For the first few months of the season, Goligoski constantly seemed to commit turnovers and coverage blunders. He wasn’t strong on the puck and seemed to lack confidence in his game. As the season moved along, his ice time went up and so did his level of play. Injuries to Daley and Stephane Robidas led to a bigger role and even more ice time in December. He stepped up as one of the more dependable defensemen in the second half of the season. Goligoski had point streaks of four and five games, even a stretch of seven points in seven games. He tallied nine points in the final 10 games of the season, and he carried that production into the playoffs where he registered four points in six games. Goligoski finished the season with a team-leading and career-best 24:19 of average ice time and the second-highest point and plus/minus totals of his career. His 42 points were good for third-most on the Stars, and his +9 was the second-highest among Stars defensemen. Dillon showed more attention to sound defensive play in his sophomore season than in his impressive rookie campaign. He continued to dish out big hits and he did register more goals and assists, but he seemed to be more of a stay-at-home, patient defenseman this season. He also drew more penalties than any other Stars defenseman. It is important to note that Dillon did not have a consistent, veteran defensive partner this season to continue to help him develop. Instead, he was paired with either rookies or struggling veterans for most of the second half of the season. Despite the less-than-ideal pairings, Dillonwas tied for the second-best plus/minus among Stars defensemen. He also improved at taking penalties. He was called for 21 more penalty minutes than last season, but he did so playing in 32 more games than last season. Dillon finished the season tied for first in Corsi among Stars defensemen, and he led the team with 168 hits. Probably the second-biggest surprise on the Dallas blue line this season behind Daley was the elevated play of Benn. The 26-year-old had an up-and-down rookie season in 2013, but he bounced back in a big way this season. In 78 games, Benn tallied three goals, 17 assists, 30 penalty minutes, 91 shots and a +16. He was the only other defenseman besides Dillon to reach 100 hits. His plus/minus rating led all Stars defenders and only trailed Nichushkin and younger brother Jamie. One of the best aspects of Benn’s play this season when compared to last season was his confidence. Last season, Benn would seem nervous and panicky in his own zone, sometimes carelessly and hopefully throwing the puck out of the zone. This season, Benn had poise, patience and confidence. He out-maneuvered fore-checkers, positioned himself well and made safe and smart passes out of the zone. He was not afraid to push up offensively, either. He did well as the late man trailing the offensive rush, and he was much better this season at pinching along the boards. I will admit the score is slightly skewed by the potential Nemeth showed this season. Thirteen games (eight in the regular season and five in the playoffs) is a really small sample to really judge or grade a player, but I felt he needed to be included in this piece for a few reasons. Nemeth has a future in the NHL, and it could (should, really) start as soon as next season. Nemeth developed a reputation in the minors as a solid, big-bodied defensive defenseman with remarkable positioning and a knack for big hits. Despite a few hiccups here and there as expected of a rookie defenseman, Nemeth displayed the same skills and reputation in Dallas as he had developed in Cedar Park with the AHL’s Texas Stars. It is also important to note that Nemeth was called up in April. The 22-year-old was brought in during the difficult final stretch of the season as the Stars fought to clinch a playoff spot, and he slid right into the lineup. He didn’t register a point in 13 games and he finished the season with a negative plus/minus rating, but his play was better than the numbers indicate. It says something that the Stars decided to carry a rookie with eight games under his belt into the playoffs against the powerful, conference-leading Anaheim Ducks. It was a small sample, but what Nemeth showed in his time in the NHL and AHL is that he is ready for the next step. Unfortunately for Connauton, he was stuck in a tough spot early this season and was then overshadowed later in the season. The Stars began the season with a crowded blue line. Connauton was the odd man out, but was not able to be sent down without having to clear waivers. He is good enough that the Stars didn’t want to lose him, but he couldn’t crack the lineup. Because of that, Connauton played in one game between the October 3 season opener and December 2. Injuries to Robidas, Daley, Rome and Gonchar opened opportunities for the 24-year-old to more regularly jump into the lineup. In his first season in the NHL, Connauton showed some potential with his speed and rushes up ice. In 36 games, he scored a goal and added seven assists. He struggled defensively, finishing with a -6 rating good for second-worst among Stars defensemen this season. He averaged 15:20 of ice time, but that number fell in the playoffs to 10:44. He did finish with a better Corsi rating than Nemeth, Gonchar, Rome and several forwards. Gonchar was easily the Stars’ biggest disappointment on the blue line this season. He wasn’t always bad, but there were much bigger expectations of the veteran this season. He signed a two-year, $10 million contract last summer after coming off good performances in the lockout-shortened 2013 season and a 37-game stint in the KHL before that. Gonchar posted 29 points in 37 games with Metallurg Magnitogorsk before returning to the NHL with a 27-point performance in 45 games with the Ottawa Senators. Though Gonchar was headed to the twilight of his career, all signs pointed to the 39-year-old still being able to contribute. He was brought in as a veteran presence on a questionable blue line with the hope of improving the Stars’ power play as he had done with the Senators and Pittsburgh Penguins previously. His twenty-two points don’t sound so bad, but eight of those came in a span of seven games. Fourteen points in the other 69 games is definitely not what the Stars were hoping for from the veteran. Gonchar’s finished the season with the worst plus/minus and Corsi ratings among Stars defensemen. His two goals were the lowest of his career since his rookie season, in which he scored two goals in 31 games. His average ice time of 17:37 was the lowest of his career and the first time he ever averaged less than 21 minutes a game. For the first time his career, Gonchar failed to register a point in the playoffs. In six games, he earned a -3 rating with four penalty minutes and five shots while averaging 13:24 of ice time. On the positive side, Gonchar tallied 14 of his 22 points on the power play and he helped the Stars in a big way off the ice by helping rookie forward Valeri Nichushkin’s transition to the NHL. This was yet another unproductive, injury-plagued and mistake-riddled season for Rome. His -6 this season rating is the worst of his career and tied for second-worst among Stars defensemen. His one point in 25 games was the worst on the team among skaters with at least 10 games played this season. Between injuries and healthy scratches, Rome played 26 total games this season, replaced mostly by rookies. He played more than 15 minutes a game eight times this season, but he also played less than 10 minutes a game six times. His average ice time of 13:05 was the lowest of his career. It’s bad enough having a rookie fill your role, but when there are multiple rookies being put in the lineup while you are on the sidelines watching, it’s clear what direction the team is headed in. His calm, physical demeanor on the ice surely provides something positives for defensive partners and teammates, but his speed and skill set simply do no match up to those Rome played against or with.